At Duke, quarterback Daniel Jones solidified his first round status with a strong throwing session and improved 40 time according to Tony Pauline. 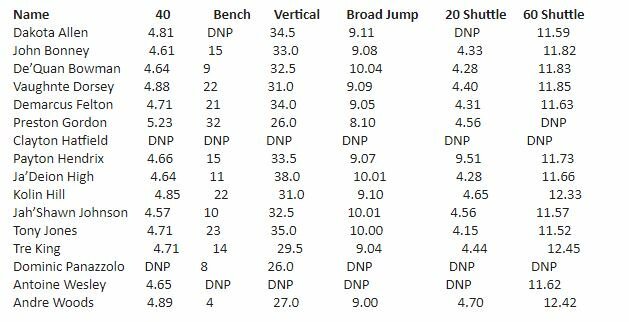 Also, linebacker Joe-Giles Harris was bothered by a calf cramp, but still posted a 7.03 in the three-cone drill, a much better number than any of his disappointing combine results. Here's a fun one. Jamarius Way still ended up with a below average #RAS, but his splits are something else. With that bad of a 10 and 20 split, and a poor but not dreadful 40, means he was really hauling at the end. Villanova OT Ethan Greenidge, a NY-area prospect out of Riverhead HS on Long Island, had breakfast with the #Jets this morning before his pro day. Jets will be looking for O-linemen in the draft. FAU's top prospect, Devin Singletary, did not run at their pro day, but his fellow running back Kerrith Whyte - a potential late-round pick- dazzled with a 4.36 40-yard dash, 11-foot broad jump, 42" vertical and 21 bench press reps.
UTSA linebacker Josiah Tauaefa, a combine snub, weighed in at 245 and posted 21 bench press reps and a 32" vertical. Texas A&M had several prospects on hand, although most of the top ones sat on their combine numbers. Potential special teams monster Cullen Gillaspia was a stand-out, as he worked out at four different positions on either side of the ball. Among the pro-day highlights were safety Donovan Wilson’s 39-inch vertical, Gillaspia’s 4.57 seconds in the 40-yard dash, and safety DeShawn Capers-Smith’s 10-foot-3 broad jump. David Montgomery ran a 4.57 40-yard dash at Iowa State's pro day, per ISU. That's a .06 jump from his NFL Combine performance. That should serve him well. Also, linebacker Willie Harvey ran a sub-4.5 40-yard dash. However, ISU has a reputation for having a fast track. In Florida, the big story was that Jachai Polite pulled up with a hamstring injury again, having had the same thing happen on the other leg at the combine. Polite, who added 20 pounds of muscle since the season, looked "sluggish" running a 4.96 in the 40. Defensive back Chauncey Gardner-Johnson crushed it in the positional drills according to Pauline and improved his broad and vertical jumps slightly. At Kansas football’s Pro Day. Joe Dineen looks like he hurt his right hamstring after his last 40-yard dash run. Not sure if he’s going to keep doing drills. Looks like he might be done. At UCF, defensive tackle Trysten Hill, a potential day two pick, stuck with his combine numbers but looked good in drills. Offensive tackle Wyatt Miller apparently worked out for the Jets. Maryland RB Ty Johnson, a big play machine and underrated Day 3 prospect, ran 4.26 and 4.35 at his Pro Day per @b3dubose. Will be selected ahead of some much bigger names at the position. Dax Raymond/TE/Utah State: 40 times between 4.58s and 4.62s at pro day, significant improvement from combine. Scouts say as many as 15 TE's selected in top 125 picks. Count Raymond in.